The Sicilian stage is a time to celebrate the Gruppo Montante, the historic Sicilian bicycle company founded in 1920 by Calogero Montante and now chaired by Antonio Montante, Chairman of the Stage Committee. Riding on a Montante bicycle in 1943, Italian director and writer Andrea Camilleri managed to escape the bombing making the journey from Serradifalco to Porto Empedocle in search of his father, a war veteran. An undertaking that the writer has never forgotten and that is reported in the book "The sprint of Kalò" and in a song by Gianni Tirielli. At 12:09 pm 192 riders (non starting: Butler) roll out from Messina, home of Nibali. From the beginning, the pace is high and there are several unsuccesful attacks. The peloton, for the moment, does not give anyone any chance. After one hour, average speed: 49.100 kph. At km 50, attack of Savini and Bakelandts, followed by Cherel, Frank, Horrach, Vanotti, Lastras, Visconti and Popovych. 9 are leading the race. At km 53, the bunch is 2’15” behind. At km 58: 5’15”. 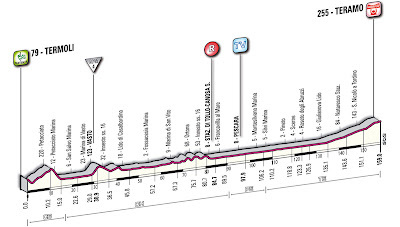 The Lampre – Isd riders dictate the pace and, at km 65, the escapees have a lead of 5’05”. In Linguaglossa (km 71), where the first ascent to the Etna (Citelli refuge), the gap between the breakaway and the chasers is 4’50”. On the 18-km climb, Belkov attacks and closes on the leaders. Average speed after two hours: 39.500 kph. The 9-man break keep on riding in agreement as Belkov is cutting down the gap and the bunch is between 4 and 5 minutes behind. King of the Mountain, 1st category: Etna – La Lenza (CT) [m 1.631]: The escapees go over the top of the climb as follows: Savini, Frank, Bakelandts and the six other escapees. Belkov is 1’48” back, while the field has a 4’23” delay. On the downhill the situation is unchanged. Average speed after three hours: 38.500 kph. 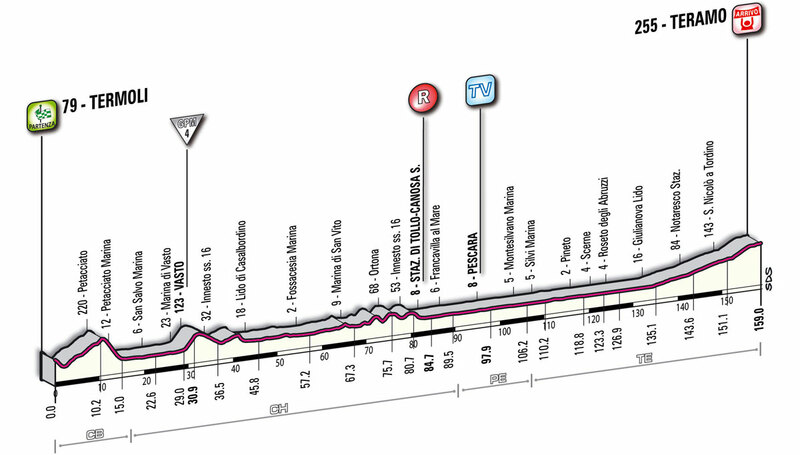 Intermediate Sprint, Acireale (CT): Lastras first at the IS, followed by Savini, Bakelandts and the rest of the break. Belkov gets there with a 2’54” delay and then slows down. The bunch reaches it at 4’15” back. With 40 km to go, the nine escapees still have a 3’55” lead. 30 km to go: 4’35”. 25 km to go: 3’10”. Average speed after four hours: 37.400 kph. The escapees attack the last climb, with 20 km still to ride to cross finish line on the Etna – Sapienza refuge – with 3’10” of advantage. 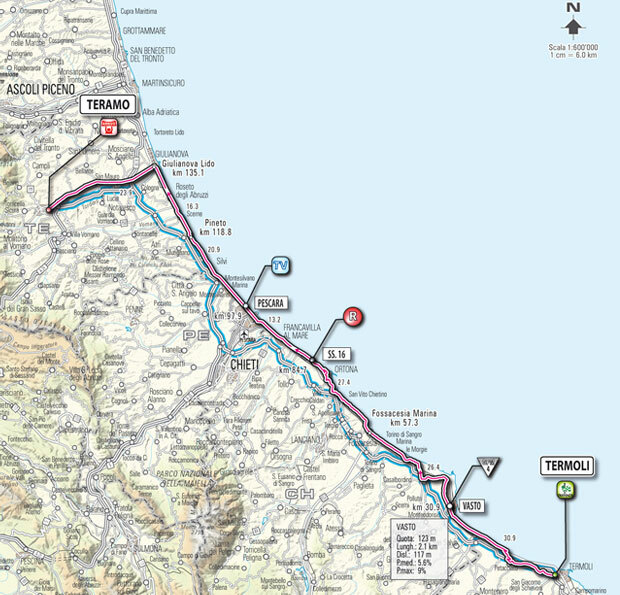 The Geox – Tmc and Lampre – Isd riders are leading the chase. On the front Franck clears off, followed by Bakelandts, Visconti and Lastras. But the latter is dropped. Three riders are leading now. The Pink Jersey, Weening, is suffering. 10 km to go, where the toughest portion of the climb begins, Bakelandts accelerates solo at the lead, as Rujano leaves the bunch behind. 7 km to go, Contador jumps ahead, followed by Scarponi. The two men catch Rujano, but Scarponi is in difficulty and is dropped. Contador keeps on going with Rujano. The duo catch Bakelandts and lead the race. 3 km to go: the two leaders ride with 1’ advantage over their closest chasers. With 1500 metres to go, progression by Contador, Rujano is dropped, and Contador flies to the finish. 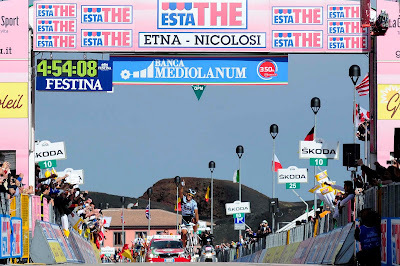 KOM 1st category, Etna – Rifugio Sapienza (CT) [m 1.892]:Alberto Contador wins en solitaire with an awe-inspiring demonstration of strength. Rujano gets second at 3”, Garzelli third at 50”, next a gruppetto with Nibali, Kreuziger, Arroyo and Sivstov. Contador is the new Pink Jersey. Time of the winner: 4h 54’ 09”, at an average speed of 34.472 kph. Alberto Contador (Saxo Bank Sungard) is the Maglia Rosa Estathé with 59” advantage. 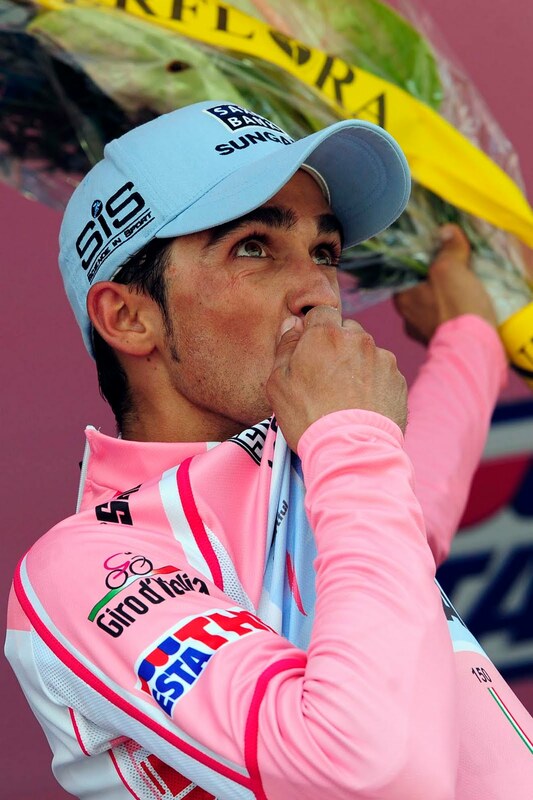 Alberto Contador (Saxo Bank Sungard) is the Maglia Rosso Passione Gruppo Saint-Gobain. Roman Kreuziger (Pro Team Astana) is the Maglia Bianca Adecco. 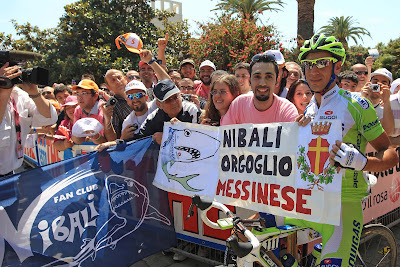 Filippo Savini (Colnago – CSF Inox) is the Maglia Verde Banca Mediolanum. Contador: "The Giro has just started. It’s really hard and anything could happen in this race." Rujano: "Contador went really hard on this climb. It's a fast climb, my form is good and I rode well but Contador is a great rider. I tried to go with him but I can only congratulate him for his ride." Nibali: "When Contador attacked, he was really strong. He was one step ahead of anybody else today." Scarponi: "I'm disappointed but it's normal to be disappointed. Contador gave us all a lesson today. I tried to follow him but I went into the red hoping the climb wasn't too steep and that I'd recover. But he went again and after that it was really difficult for me." Kreuziger: "It was impressive, I saw the size of the gear he was using when he went. I turned around and I still had two teammates, and I didn't even try to go after him because I didn't feel I could." Today, Monday, May 16th is a rest day. Stage 10, Termoli-Teramo, 159 km is classified "Pianeggiante". A chance for the sprinters. Stories for the Italian Cycling Journal about rides, granfondos, watching and touring during the Giro, having a good time cycling in Italy, Italian cycling history, etc. are always welcome. Contact me at veronaman@gmail.com. There are more than 1,900 stories in this blog. The search feature to the right works best for finding subjects in the blog. There is also a translate button at the bottom so you can translate each page. Decals for Restorations, Repairs, etc. How About a Training Camp with Mario Cipollini?